Sevenoaks Vine Cricket Club has been present in Sevenoaks since 1734 and they have always played their home matches on the iconic Vine ground in the heart of the town. Andy Richardson, the new Chair of the club talks us through the club’s ambitions and frequent misconceptions associated with cricket clubs. We joined him on the boundary for an afternoon of cricket as they hosted local rivals Holmesdale CC in the Kent Premier league. Words by Steve Rowley and photos by Alan Smith, SVCC. Cricket has always been seen as an elite sport for the very rich and carries with it a proud history more than any other sport in the country. However, as times have moved on, we are still playing the game of cricket some 350 years later, and the rules really haven’t changed that much, although the elite-ship has certainly lost it’s grasp on the game to the masses. The earliest known report of cricket taking place in Sevenoaks is based on an article in the London Evening Post of a match between the Gentlemen of Kent and Sussex, which took place on September 6, 1734. On that occasion it was Lord John Philip Sackville who pitted his team, and his purse, against the Gentlemen of Kent and Sussex, and it’s this recording that makes the Sevenoaks Vine CC (SVCC) the second oldest cricket club in the world. The Sackvilles of Knole were among the many aristocracy of the day who matched their XIs against neighbouring estates for high stakes. In 1773, John Frederick Sackville, the 3rd Duke of Dorset and a great patron of the game, presented the Vine Ground out of the Knole Estate to the town of Sevenoaks to be a cricket ground forever. Great England players of the era including Lumpy Stevens, Joseph Miller, William Bowe and John Minshull, who were all employed on the Knole Estate, were feared by the famous Hambledon Club and in fact it was reputed that the accuracy of Lumpy Stevens’ ball through the – then two – stumps, led to the introduction of the third [middle] stump on June 18, 1777 on the Vine itself. A proud history indeed, however Andy Richardson, the Chair of SVCC openly admits that cricket and the club need to move with the times. The club have always boasted a proud alumni of players who have gone on to play for Kent and England such as David Fulton, who is now a regular Sky Sports presenter and pundit. The list also includes overseas players as well, the most notable of these is Steve Smith, who played for the Vine when he was 18. He is currently the captain of the Australia National Cricket team across all three formats of the game. 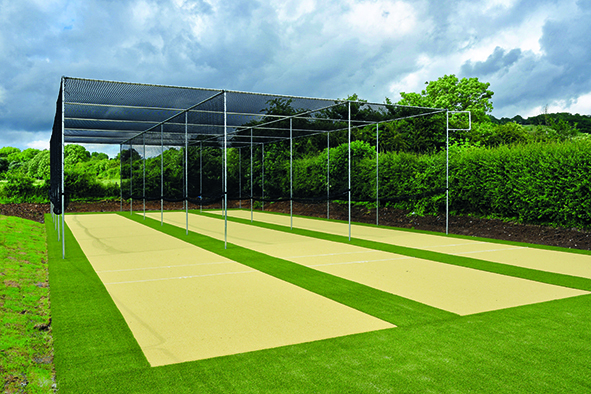 The club are making great strides to include all age groups and have recently held sessions at the Otford Recreation ground as part of the ‘All Stars’ campaign which is a brand-new initiative from the England and Wales Cricket Board aimed at providing children aged five to eight with a great first experience in cricket. SVCC recruited 60 children to participate in the campaign providing them with eight one-hour sessions, held over eight weeks. The national average was 24 children per club. As part of the Chance to Shine charity, the club have appointed Harry Johnson and Jen Hamer as local ambassadors for schools. They have been making contact with all the local schools in the area to offer them free coaching sessions. The club picks up the bill for the coaching staff. St. Georges CofE School in Wrotham have been one of the first schools to sign up for the free taster sessions with a number of after school sessions taking place towards the end of the summer term. SVCC currently have around 170 children signed up to their junior section of the club, which is a fantastic achievement given the number of cricket clubs in and around the local area. However, as the players get older, and with the pressures of exams and their peers, most choose not to continue with progression in Cricket. Harry Houlihan, one of the young members at the club, is one exception though. He recently played at the Bunbury Festival, a gathering that is widely known for finding players who could potentially play for England one day. Harry performed so well that he was subsequently discussed on TalkSport Radio at great length. The recent result in the ICC Women’s World Cup will definitely help the club progress with girls getting involved in the game, and they hope to have a full women’s team ready for next summer. Andy Richardson commented that they have to create a more welcoming environment within the club to attract more women to participate, not just on the pitch but on the committee too. So much so, that they hope to create a ladies social secretary position this year. So as the club progresses with young players coming through and new initiatives, they will forever keep their place in the heart of the town, just like the 3rd Duke of Dorset decreed. One tradition I personally hope they don’t dispose of, is the annual Peppercorn rent presentation, which takes place at the end of July each year. 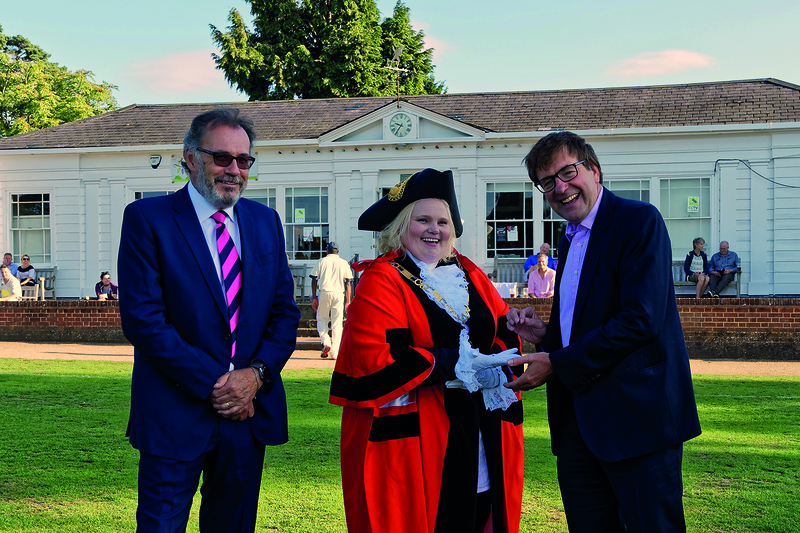 This year Mayor Maxine Chakowa proudly accepted two peppercorns from the current Lord Sackville in exchange for the ground rent and the use of the pavilion (although the latter now officially sits with the council). Where else in the country would you still see this happen? At the end of July, Sevenoaks Vine CC hosted their nearest competitors, Holmesdale CC, in a bottom of the table clash. With the endless summer rain looking too heavy for the pitch to hold up, both clubs, along with the umpires, managed to see a reduced 30-over match to its conclusion. Sevenoaks eventually won the game after chasing down an adjusted target of 178 set by Holmesdale. The Vine hit 181 for 2 from 27.1 overs with Harrison Smyth collecting the Man of the Match award for his game winning innings of 86 not out. All other matches in the league on the day were called off due to rain.